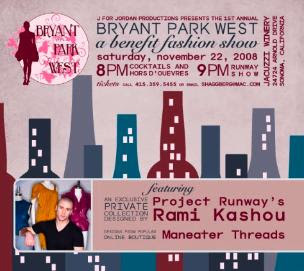 Rami Kashou was the featured designer at Jacuzzi Winery's "Bryant Park West" on November 22nd. Read more here, and here. More photos here from our friends at Maneater Threads. Who put this all together? It was the brainchild and Master's Thesis of Sarah Haggberg. Read more about her here. Daniel returned home to Grand Rapids for an appearance at Schuler Books and Music yesterday. With the lure of microbreweries and a promise to avoid any malls, my husband and I set off from just outside Detroit this morning to Grand Rapids for Daniel Vosovic's book signing at Schuler's Books & Music. It was super. Daniel spoke for about 40 minutes before the signing. He was incredibly charming, intelligent, kind and warm. It was an extra treat to see him on his home turf with friends and family in attendance. It goes without saying that the book is beautiful. He has made a lot of wise decisions to guarantee a long career. I expect many more great things from him. Jack Mackenroth has designed a new t-shirt to benefit HIV/AIDS Awareness. Click here for more information. Click here to order. Christian Siriano will be in Columbia, South Carolina on December 2nd. Click here for more information. Click here for an article about Keith Bryce. 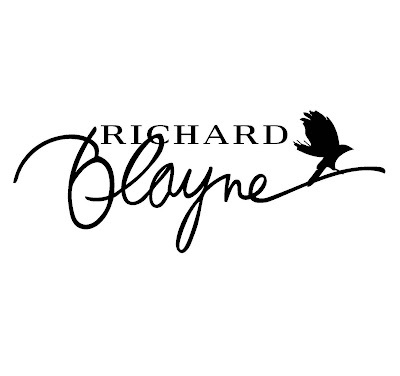 Blayne Walsh will be launching his first official collection “Richard Blayne” on Dec 1st at Hotel 1000 in Seattle, WA. For more information please contact Nadia Yun. That was another Rami Kashou design on last night's results show. Thanks Kit Pistol for the great photos! Tim Gunn goes shopping on Fifth Avenue. Click here for the Nightline video. Christian Siriano will be on next week's episode of "The Biggest Loser." Click here for a preview. Click here to see Jack Mackenroth's holiday gift suggestions, including Daniel Vosovic's "Fashion Inside Out." Daniel will be appearing in Grand Rapids, Michigan on Friday. Click here for more information. Daniel travels to Washington DC on Monday. Click here for more info and to purchase tickets. Click here for a new interview with Christian Siriano from his hometown station. Don't miss the video. Christian will be in Charlotte on December 4th. Did you watch "Dancing With The Stars" last night? Samantha Harris always looks fabulous - thanks to her stylist - Kit Pistol! 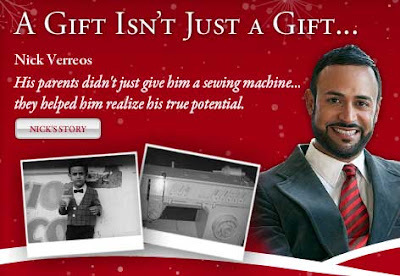 Click here to read more about Nick Verreos's "Grant a Wish" commercial for Sears. Be on the lookout this week for the premiere of this adorable ad. Click here for another look at Christian Siriano's designs for The Pussycat Dolls from our friends at MyItThings. Attention Atlanta: Mychael Knight is holding a sample sale tonight. Click here for details. Also tonight - tune in to Blog Talk Radio for a live interview with Stella Zotis. Columbus Ohio Photographer, Maggie Phipps covered Kelli Martin's Fashion Show On November 21st and generously shares the photos with BPR. Click here for more. Fellow blogger Megan Dean also attended the event and sends this report. Megan's friend Peter made this video. Project Runway Season Five designer Suede and Top Design Season Two contestant Serge Van Lian will be among the celebrity guests at the first annual Lynx Ensemble Theater Benefit Gala. Click here for more information. Fresh from her appearance on Tim Gunn's Guide to Style, Eliza Neals will return home this weekend for what she described as a night of "fashion, fun and music" at Detroit's Cliff Bells.Click here for details. Click here for more from Tim Gunn's visit to Madison Wisconsin. The latest in Project Courtroom? 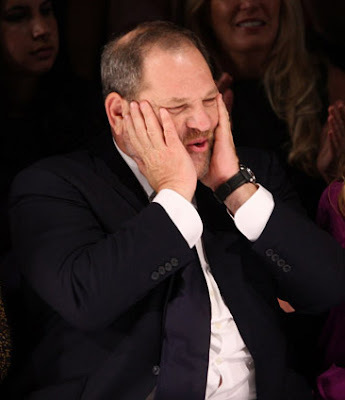 Weinstein layoffs. Click here to guess the mystery hair care brand! Thank you for not spoiling the ending! 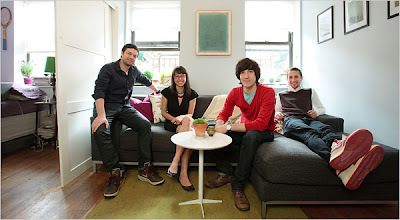 Click here for a New York Times Article about Daniel's Apartment and Roommates. Don't miss the video. Leanne Marshall and Nick Verreos will be among the designers showing at the FIDM Presidential Inaugural Luncheon and Fashion Show in Washington DC. Click here for more information. Rami Kashou will be at "Bryant Park West" tomorrow night. Click here for more information. The LA Times says "Yes on Proj. 6." Click here for a new interview with Christian Siriano. Just as a reminder, you can also purchase 'CAT,' the finale music used by Kenley Collins by clicking here. You can also purchase 'Cookie Breath,' the music used by Leanne Marshall by clicking here. Rachael Ray's "Cook for the Cure" features a pasta recipe from Kevin Christiana. Thanks Kevin! Did you watch Mychael Knight on The Real Housewives of Atlanta finale? He was a voice of sanity. BPR friend, David Gilmore has been blogging and sketching about the show all season. Check it out. The finale of Tim Gunn's Guide to Style is tonight, Thursday 11/20 @ 10/9c. Tim's client for this special episode is Erica, a bride-to-be with a serious confidence problem. Her tall stature leaves her self-conscious with every outfit she tries on. Can Tim help her restore her faith in herself in time to step into the spotlight on her wedding day? More Project Courtroom drama here. Read more about Nick Verreos's "Wishtory" here. 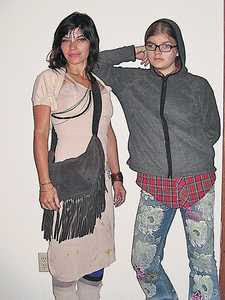 Attention Tucson, Arizona, Elisa Jimenez will be showing her designs tomorrow night at the Museum of Contemporary Art. Click here for more information. Attention Arkansas Fashion Designers: A Fashion Designer Casting Call will take place 3-6 p.m. Dec. 7 at Park on the River, 12001 Crystal Hill Road, Maumelle. Designers are encouraged to try out for a chance to be one of eight chosen to participate in the forthcoming second annual Designers’ Choice Fashion Preview in Little Rock. Hopefuls must bring three complete garments; a portfolio or pictures of their work; and photographs of themselves no larger than 5-by-7. Designers will also have an opportunity to participate in fashion-show workshops presented by Korto Momolu, Project Runway Season 5 ’s first runner-up. For more information, call Theresa Timmons-Nooner at (501 ) 247-5497. Please join us over at Blogging Stylista tonight at 9:00 and then join the fun at Blogging Top Chef at 10:00. BPR Field Reporter Nancy T attended Christian Siriano's birthday party last night - thanks Nancy! On November 18th, over 200 friends crowded together at NY’s citrine for Christian Siriano’s surprise 23rd birthday party. I got to attend as Blogging Project Runway’s NY representative. 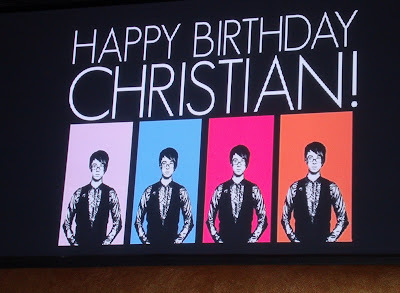 What this means: a fabulous party scene AND a kiss from Christian when I wished him Happy Birthday from everyone at BPR! No, the party didn’t end up being a surprise; one guest told me that Christian emailed her the invitation earlier that day and told her to ‘get on the list.’ And, having a red carpet outside the club kind of gave away the game. It didn't matter. Christian was all smiles as he arrived with boyfriend Brad Walsh, received gifts and hung out with his adoring posse. Click here for the latest NYTimes article about the future of Project Runway. There is nothing at all encouraging in this article. Our best hopes were for a quick out-of-court settlement, a season six premiere in December and a February Fashion Week Finale. This now seems quite unlikely. “From what I know about courts, it could be well into the early spring before anything is decided,” said one lawyer involved, who spoke on the condition of anonymity to avoid further inflaming passions among the opposing parties. Barring an out-of-court settlement — and insiders say there are no such negotiations taking place — “Project Runway” seems unlikely to be back on the air for months at best. The season finale of “Project Runway” typically takes place during New York Fashion Week, the twice-yearly series of runway shows in Bryant Park in Manhattan. The next round of those shows is scheduled for February, and a person involved in the production said that the producers of “Project Runway” were planning to shoot the finale at that time. Because each season of the series stretches out over 14 weeks, episodes of the new season could be broadcast before the final competition takes place. Click here to watch Nick's commercial. Heidi Klum is on the cover of the December issue of InStyle magazine. Click here for Heidi's "Top Five Rules for Succeeding in Business." Click here to vote on Blogging Top Design's Chandelier Challenge. This has been a lot of fun. Nick Verreos will be in San Diego tomorrow night, November 19th for the grand opening of the new FIDM campus. Click here for more information. Click here to listen to Blayne Walsh on Reality Check Radio. Mychael Knight recently appeared at the grand opening of the Nike Store at Lenox Mall in Atlanta. Season Three Fan Favorite, Mychael Knight is featured Tuesday night on Real Housewives of Atlanta. Project Runway Philippines has concluded and it is really fun to watch our favorite show from the perspective of another culture. I'll try to post one episode a day. Please do not spoil the ending. Thanks everyone and thank you Sweetprojects. Rami Kashou will be at "Bryant Park West" on November 22nd. Click here for more information. Click here for an interview with Jay McCarroll. Click here to read Jack Mackenroth's post about "Fashion Forward." Virginia Fashion Week kicks off today in Charlottesville. Kayne Gillaspie will be one of the featured designers. Click here for more information. Christian Siriano joined Heidi Klum and the rest of the VS models for the annual Victoria's Secret Fashion Show at the newly-renovated Fontainebleau hotel in Miami. The show will air on December 3rd on CBS. Click here to see lots of photos. Click here for a fabulous behind-the-scenes video. Afterward, the crowd partied in Miami Beach. Click here for more info and lots more photos. Did you miss this moment from the EW.com video? Just checking. Tim Gunn offers up a little teaser about the Season Six finale. No decoys? Hmmmmmm.... Better get things rolling. Tim Gunn will be in Arlington Virginia today and Fresno, California on December 6th. Click here for more information. Daniel Vosovic will be in Washington DC at the Corcoran on December 1st. Click here for more. Designer pizza with Christian Siriano on Sunday night, December 7th at 24 Prince. Entertainment Weekly Names "Top 25 Stars of 2008"
The "Stars of Bravo" come in at #12! Click here to read more. 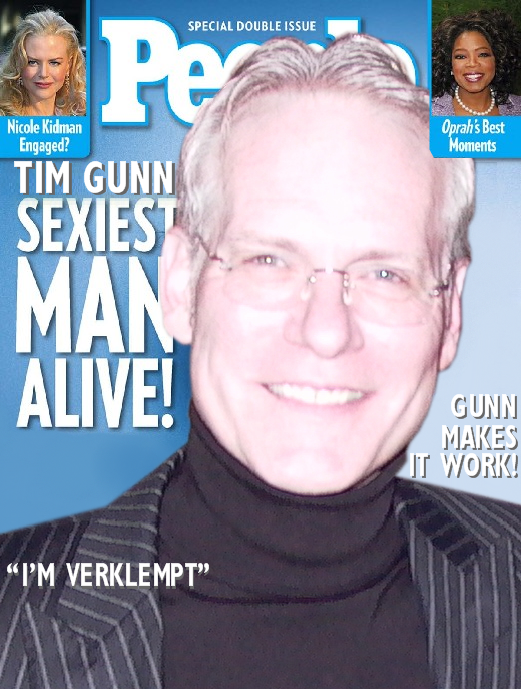 Click here to watch a video interview with Tim Gunn. Congratulations to all of the great Bravo Reality Stars! Nick Verreos and David Paul have returned home after a very busy week in the Bahamas. The "Islands of the World Fashion Week" news has been filling the mailbox and by all accounts, it was a lot of fun and a grand success. Of all of the glamorous images from the event, of course I had to select this one as my favorite. On the left you'll see Nick's parents, Jim and Raquel and his adorable niece and nephew Casia and Alain. It's great that Nick and David were able to include their family in this experience. 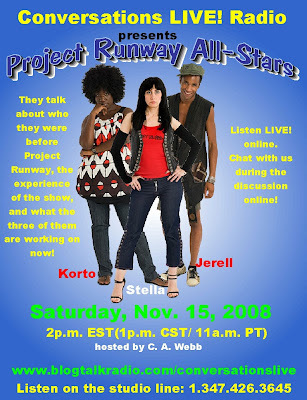 Korto Momolu, Jerell Scott and Stella Zotis will be on blogtalkradio tomorrow. Click here to visit Leanne Marshall's blog. Would you like to study Fashion Design? Visit one of the FIDM Open House events this weekend and next. You might meet Nick Verreos. Click here for a great article about Charleston Fashion Designers. BPR Field Reporter Jonathan Trimm interviewed Daniel Vosovic for BPR. Thank you Robert Graves for setting this up for us, Thank you Daniel and thank you Jonathan! Last Thursday night at the Santa Monica Public Library, Daniel Vosovic sat before a group of devoted fans and discussed his new book, his education, his time on Project Runway and held a short Q&A at the end. He began by discussing his entry into the fashion world, and then continued to talk about his studies in Italy where his whole perception on life and fashion changed. Here's one more Halloween entry - Suede and Stella. Adorable. Thanks Jason T.
Tim Gunn is in Milwaukee tonight. Click here for more information and to listen to an interview. Daniel Vosovic is in Chicago. Click here for Laura Bennett's latest parenting column from The Daily Beast. Click here for more from Best Week Ever, including a glimpse of "Casual Tim." Click here for some great photos from last night's "Fashion Forward" event. Tim Gunn Hosting "Fashion Forward" Event Tonight. 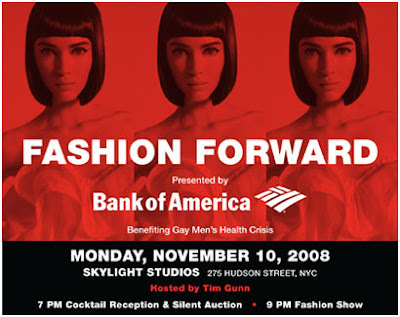 Tim Gunn is hosting the GMHC's "Fashion Forward" fundraising event tonight in NYC. Malan Breton has donated two (size eight) designs to the benefit auction. Of course we would love to hear from anyone who is able to attend this event. BPRs, we told you on Friday that Jay McCarroll had written to let us know that the inaugural gown sketch was not his. Today, the Daily Beast website has issued an apology and an explanation. Just in time for the holidays you can select fashions tonight on QVC by Season 3 finalist Laura Bennett and Season 2 winner Chloe Dao. Between 8 and 10 Eastern tonight you can watch 'PM Style® -featuring Holiday Designer Gallery.' You can click here to see the elegant and glamorous Laura Bennett offerings and you can click here to see the fun and trendy Chloe Dao garments. While you're shopping, don't forget that Season 2 designer Emmett McCarthy has some chic handbags (click here) and that Season 1 winner Jay McCarroll also features gorgeous garments on QVC (go to QVC and enter 'Jay McCarroll' in the search box); I always receive compliments when I wear my Jay McCarroll Checkerbox Topper Coat in the grey combo. Be fabulous on a budget with Project Runway designers and QVC! This video was created by erbn. NYC Field Reporter, Nancy T covered the launch of "Fierce Mamas" for BPR. Thank you Nancy! Between now and November 15, you can buy affordable, stylish holiday clothing made by Christian Siriano. The catch – it will fit you better if you’re pregnant! Christian has teamed up with Moody Mamas to produce the first celebrity maternity line, called (appropriately) Fierce Mamas. His Capsule Collection for the Holiday 2008 Season will only be available at Belly Dance Maternity Store in NY or on their website. But since they will be making the clothes to order based on on-line demand, you have to order them now, for December delivery. I went to Belly Dance Maternity to interview Christian. Because I arrived prematurely, I checked out the collection and even tried some on. The color palette is silver, scarlet, and black, and most are shiny and girly. Most are cut in a way to celebrate the pregnant body, showing off impressive pregnancy cleavage and expanding belly bump. Best of all, everything costs $175 or under, except for a limited edition black silk dress with soft ruffles on the décolletage (shown in the bottom photo) which costs $250. Some can easily be worn by non-pregnant women. There’s a gray jersey top with side ruching which looked current and flattering on me, a size 4/6 with a flat stomach. Also, a dressy belt could be used to make these dresses wearable by the non-expectant. I say – at this price -- go for it. I also spoke with Marta Abrams and Elise Rosemarin, the creators of Moody Mamas. Marta was good friends with Christian when they were both students in London. They mentioned that their clothes have been worn by Ashlee Simpson, Tori Spelling, Jessica Alba, and Laila Ali. 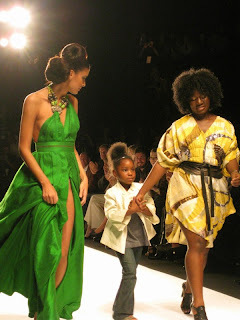 Also, there will also be a Christian-designed Fierce Mamas collection in Spring 2009, with brighter colors and new silhouettes. Here’s Christian, flanked by models in his dresses. Christian Siriano's Maternity Line from Nancy T on Vimeo. Jack Mackenroth - Chocolate Fashion!